There are 3 days left to fish running water before the season ends. I’ve looked back through my last two diaries and noticed that on each occasion I’ve tried to fish Throop and found it very difficult. It’s no the conditions but the number of people who descend on the fishery. People are queuing to get to swims early in the morning. Once you get there you are unable to move swims. Crowded fisheries are not my favourite although next year I’m going to fish the Royalty for some barbel so I may need to reconsider. Willow has been difficult to fish this year due to excessive weed growth and very few clear patches. A few roach had come out recently but not in the numbers of last year. There are just a few dedicated roach anglers who fish it all hoping for that 3lber. So forgetting the rivers for a couple of days and concentrating on the roach would be different. One of my worries when changing venues and fishing methods is that I’ll forget something, cooker, water, kettle etc. Luck was with me as I remembered everything. Arriving at 6.30am it was light enough to see across the lake to the other bank. I didn’t want to fish where a mate had been fishing as it looked as though I pushing in, so my choice of swims was one where nothing had been caught this year. Having said this last year there were only two swims that produced the large roach and it was always a scramble to get one of these. It really was a foggy morning when I arrived, a few accidents on the motorway and delays lengthen my journey time. I was greeted by a windless day and a temperature of 8c. The lake was empty of anglers however Christchurch was very busy as normal. I felt around a little with the feeder trying to locate some clear spots. There were precious few and those I found happened to be quite small, and at almost 60yds accurate casting was a must. Soon though out went the feeders on the 3 rods. I’ll explain the rigs later in the video. I had forgotten what it was like to set up camp and the bivvy. Better get used to now as this is home for the next 5 or so months for a few days each week. It didn’t take long for my first bite 2 hours later. Have a look at this short video of the two days fishing. So you can see that a few roach were caught and plus some bonus rudd. There seemed to plenty of surface activity from the roach and rudd on the first morning but little on the second. I missed 2 bites in the 2 days which is very unusual. I did get one take from a brown monster (carp) but it broke the hooklink very very quickly in fact I just felt a bump of the rod top. The thing is you just lift the rod into the takes you get whether it’s rudd, roach or carp. 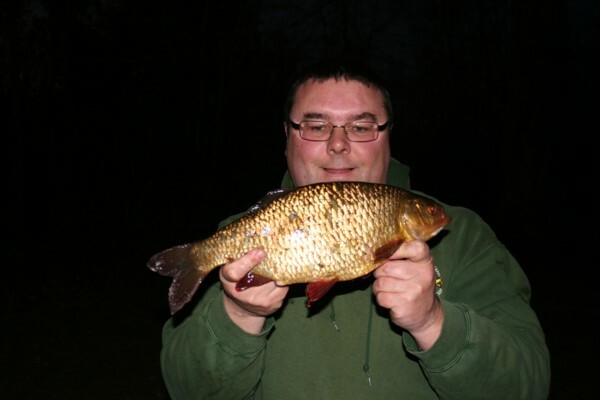 Another mate of mine Vince fished the lake for the Monday evening and caught a pb rudd of 2lbs 11oz. I had just returned to my swim to make him a brew. He was going to come down for it but I suggested I bring it up for him. Good job I did because at as I approached his swim he was just lifting the net. It’s great when someone gets a pb. Not satisfied with this he only got a 24lb plus pike from the Thames the next day. Top fishing from a really nice bloke. Looking at the feeder in the water it always good to see the spread of maggots. 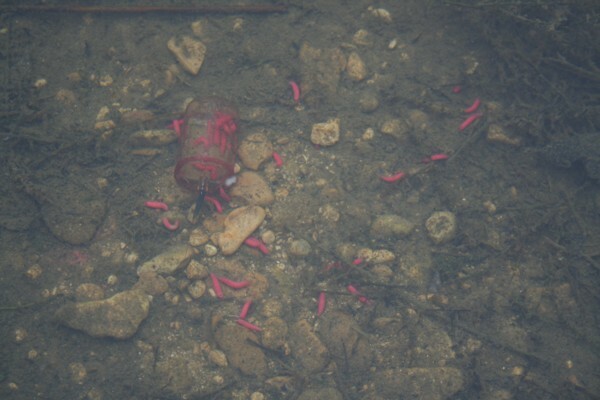 The two maggots at the bottom area of the photo are the ones on the hook. So a great start but time is running out. A few of us will now be hoping for a few more 3lbers before the season is out. The 4 of us who share the info on the lake have a cunning plan next year (if we join) to create clear patches in the weed. It works for me on Horseshoe lake so why not on Willow. This entry was posted on Thursday, March 15th, 2012 at 5:53 pm	and is filed under Uncategorized. You can follow any responses to this entry through the RSS 2.0 feed. Both comments and pings are currently closed.